Game 1: Chrono Trigger lived up its billing as a number one seed and all time classic as it smashed the well respected Gamecube remake, Resident Evil, and earned itself a spot in the Elite Eight. It joins FFVI as the second 16 bit Square RPG in the final eight. Game 2: Shovel Knight put up a brave fight against a game well known to have been a strong influence on it, but Mega Man 2 was too much for the retro indie title. The Blue Bomber has his work cut out for him in the next round. Can he continue his run against the top seeded RPG? 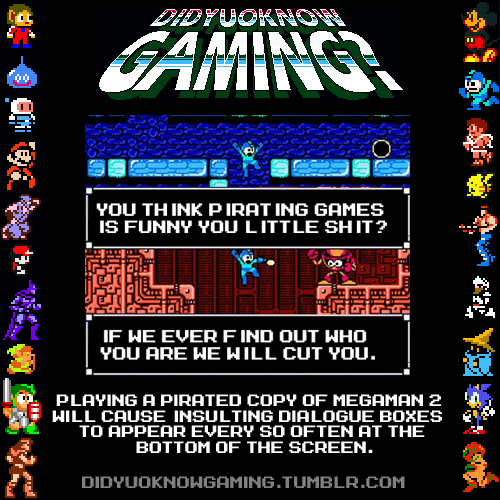 Mega Man 2 is the only remaining representative of the 8 bit NES generation. Both my choices made it. I guess I agree more with the top picks than the lower picks. Too bad about Shovel Knight, but losing to Mega Man 2 is hardly an insult. And I gotta hand it to Capcom's game; not only is it a great game that still holds up today, they put some pretty cool anti-piracy coding in it. I guess pirating games was an issue back then, too.